The President of the Parliament of Montenegro Mr.Darko Pajović and the President of the Assembly of the Union of Municipalities of Montenegro Mr.Slavoljub Stijepović, Mayor of Podgorica, signed the Cooperation Agreement between the Parliament of Montenegro and the Union of Municipalities of Montenegro on July 1st 2016. Agreement on cooperation between the supreme legislative body and the Union of Municipalities, primarily aims to improve the system of local self-governance through the strengthening of institutional dialogue between the state and local authorities in order to create conditions for more efficient and higher quality services to citizens and businesses by the local government. 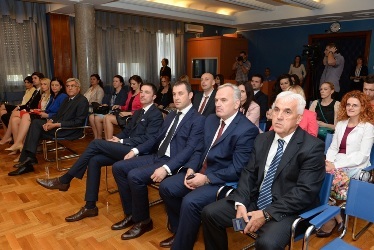 The signatories expressed their belief that the formalization of cooperation and using of established mechanisms will significantly contribute to the improvement of the legislative framework and better functioning of local self-government, and that the concrete results of cooperation and joint work will soon be seen in practice. President of the Assembly of the Union of Municipalities of Montenegro, Mr. Slavoljub Stijepovic said that the act of signing this Agreement, together with the previously signed Agreement on Cooperation with the Government, is one of the most important events in almost half a century long history and operation of the national association. He stressed that for the efficient work of local governments in solving the problems of citizens the adequate legislative framework is especially significant. At this level, the role of the Parliament of Montenegro, as the legislative body, is irreplaceable. Mechanisms of cooperation established by the Agreement will open new opportunities to work together on developing the legislative framework and ensure greater participation of local governments in the work of parliamentary working bodies in the field of adoption of the legislative framework for local government that will be functional and applicable in practice. On the basis of the Cooperation Agreement, the President Pajovic stressed that very soon the priority issues of cooperation will be defined, thus showing that the signing is only the first step in the planned adoption of the legislative framework that is necessary for the better functioning of local governments. He particularly emphasized that the Agreement has no political nor ideological characteristics, and that the establishment of cooperation between the Parliament and the Union of Municipalities is in the interest of local governments, and, therefore, in the interest of all citizens of Montenegro. Today’s signing ceremony of the Agreement on behalf of the Union of Municipalities, was attended by: President of the Executive Board Mr.Aleksandar Bodanovic; Vice-Presidents of the Union Assembly Mr.Dragoslav Scekic and Mr.Orhan Sahmanovic, Secretary General Mr.Refik Bojadzic, his associates, and, on behalf of the Parliament of Montenegro, attended by the Secretary General Mr.Sinisa Stankovic and his associates.